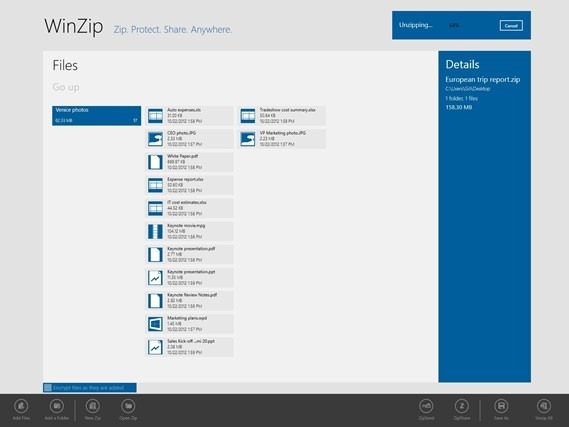 The apps for Windows 8 are still streaming through, and if you’re the type of user whom constantly deals with archived content, you’ll be pleased to know that WinZip is now available to download. Renowned for its powerful set of features in archiving and unarchiving file bundles from .zip to .rar, WinZip is among the foremost applications in its field. The Windows 8 edition has been especially tailored to the new ecosystem – bringing that familiar fast and secure file-bundling system to those running both PCs and Windows 8 tablets with touch interfaces. The primary reason for archiving content is sharing. For example, when you want to send a number of images or documents to somebody via email, archiving them up using a tool like WinZip is by far the most efficient way of going about it. It’s especially good for larger files and folders, and as well as making logistical sense, WinZip offers heightened security by means of a password. With privacy and security two of the most treasured commodities at a time when most of us live a portion of our lives through the Web, WinZip ensures your data is protected as it makes its way from A to B. As time has progressed, WinZip has expanded to incorporate social media, and as such, one can utilize the integrated ZipShare functionality to share any kind of file or folder with friends on Facebook – a network with over a billion active users and counting. The look and feel of WinZip has also evolved naturally with Windows, and the Windows 8 version feels just as native as all older versions have done. The very best apps have this uncanny knack to operate as though they were part of the ecosystem, and not only has WinZip managed this with aplomb throughout its time as a primary Windows app, but has done once again with the Windows 8 version. WinZip is also intertwined with Windows 8’s Share charm, so you can easily send your zipped files straight to friends, colleagues and associates using Microsoft’s integrated system. All in all, the WinZip team has delivered a high standard of app once again, and if you want to grab it, you can do so via the link below.